Of all the factors that prospective students should consider when choosing a degree program, college accreditation is one of the most important. Attending an educational institution, either on campus or online, with inadequate or no accreditation could potentially jeopardize students’ financial aid, transfer of credits, and even job or graduate school prospects. Here’s a guide to understanding the intricacies of college accreditation and what it means for students’ academic years and beyond. College accreditation is a process by which colleges, universities, or other institutions of higher learning and their programs are evaluated. An outside authority, almost always a non-governmental entity overseen by a state or federal agency, conducts the process to ensure that the school or degree program meets established standards for program quality and rigor, US News & World Report explains. Factors that accreditors also consider include professional standards, qualifications, and teaching ability of the instructors. Accreditation assures everyone from students to potential employers that the education provided by the school and its teaching staff is trustworthy. The difference between accredited and unaccredited schools or programs is vast. Some unaccredited programs may claim to offer non-traditional yet valuable learning experiences, but overall, accreditation could mean the difference between a successful college career and a future full of worthless credits. The character of educational institutions and the quality of their programs can vary widely, according to the U.S. Department of Education (DOE), and individual states exercise varying degrees of oversight. Accreditation agencies help provide a measure of quality control and allow prospective students and their families to be able to compare apples to apples when evaluating programs and choosing a school. “To ensure a basic level of quality, the practice of accreditation arose in the United States as a means of conducting non-governmental, peer evaluation of educational institutions and programs,” according to the DOE. After passage of the Higher Education Act (HEA) in 1965, Congress expanded the role of accreditors. The agencies assumed responsibility for ensuring academic quality at institutions where student aid funds could be used and were therefore subject to oversight by the federal government. Accreditors fall into three categories – regional, national, and specialty or programmatic – and must apply for DOE recognition. Institutions must seek accreditation. The process starts with the institution’s application, which describes its programs and explains how it meets the accrediting body’s standards. The school also pays a significant fee to cover the cost of the process. After the accrediting body deems the paperwork in order, assessors or a survey team are sent in to investigate the school’s claims. Their work involves sitting in on classes and speaking with students and faculty. If no problems are found, the school is cleared for the list of accredited institutions. The process repeats periodically to make sure schools continue to maintain their standards. The DOE is not directly involved in the accreditation process but does publish a list of recognized accrediting agencies. The Board of Regents of the State of New York is also federally recognized as an accreditor, the only state to possess such a distinction. A sixth, the Accrediting Council for Independent Colleges and Schools, is recognized by CHEA though not by the DOE. The third type of accreditation, programmatic, can apply to entire schools — generally smaller or career-oriented institutions — or to specific programs within established colleges and universities. Many programmatic accreditors focus on specific fields such as professional education or arts programs, or a particular type of institution, such as faith-based schools. Most programmatic accreditors are recognized by CHEA or the DOE or both. In all, more than eighty accreditation agencies are active. CHEA is often called the “accreditor of accreditors,” the body that makes sure that other accrediting bodies uphold basically compatible standards. Because of CHEA’s oversight, credits earned at a college in the Northeast transfer smoothly to a university in California. When people speak of accreditation, they typically mean the regional rather than national variety. Regional accreditation is highly respected and perceived as more prestigious. Most two- and four-year non-profit or public (state-owned) colleges and universities have regional accreditation. Regional accreditors, as the name suggests, focus on schools within their geographic area. Regionally accredited schools tend to be more academically rigorous. They typically accept academic credits from other regionally accredited institutions, but are reluctant to take transfers from institutions with national accreditation because those schools generally don’t meet standards for faculty qualifications and library resources, according to EdSmart.org, an independent college review journal. Coursework and degrees from nationally accredited schools also may not be acceptable to licensing boards, which could affect graduates seeking careers in teaching, accounting, or healthcare. Some CHEA-approved agencies award national accreditation for schools that focus on technical, vocation, or distance learning. Nationally accredited institutions tend to be more practical and career-oriented, may be less expensive, and may have more relaxed admission standards. Reputable universities and colleges may also seek programmatic accreditation for their online offerings. Also called specialized accreditation, programmatic accreditation “normally applies to the evaluation of programs, departments, or schools which usually are parts of a total collegiate or other postsecondary institution,” according to the DOE. Certain programmatic accreditors also accredit professional schools and specialized or vocational institutions. Specialized accrediting agencies also may accredit educational programs within non-educational settings, such as hospitals. To find out what kind of accreditation your chosen school or program has, look at its website. The accreditation page may be listed separately or under another heading, such as academics. Check the school’s history. Even good institutions can have a lapse or an issue that can jeopardize their accreditation. Some schools or programs choose not to seek accreditation or renewal of their status. The prestigious Medill School of Journalism at Northwestern University opted not to renew its accreditation, calling the process superficial, time-consuming and ultimately not useful, according to a Chicago Tribune article in May 2017. Look at programmatic accreditation, especially if you are interested in a specialized or career-focused program of study. Check out the accreditor and make sure the organization is recognized by a reputable accrediting body. Maryville University, for instance, is regionally accredited by The Higher Learning Commission (HLC) and is a member of the Chicago-based North Central Association of Colleges and Schools. Maryville’s accreditation webpage also offers a link to the HLC page so prospective students can verify the status of the accreditation. It shows that Maryville received its original accreditation on January 1, 1941. Accreditation was reaffirmed in 2015 and an assurance review is scheduled for June 2019. Maryville’s page also lists accreditors for individual programs including business and nursing. DOE website has a searchable database for students who want to verify a school’s accreditation. Schools that are not accredited or whose accreditation may be questionable pose a risk for prospective students, especially those pursuing an education online. Some institutions may balk at the cost and complexity of the accreditation process or offer a non-traditional learning format, yet still provide a useful and comprehensive learning experience, EdSmart.org notes. Many others, however, fail to seek accreditation because they are poorly run and offer ineffective programs. Or the school may be a diploma mill – one that offers degrees for a price while requiring very little coursework. The school has numerous student complaints about educational quality. The “accrediting agency” is not recognized by the Department of Education. In short, be wary of programs that seem too good to be true. 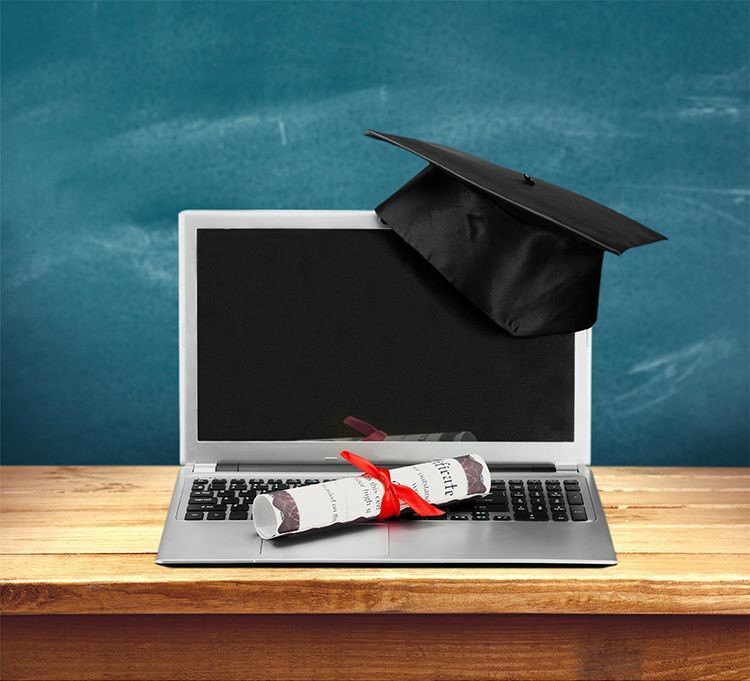 Online education is becoming an increasingly viable option for college and graduate education. Nearly 30 percent of post-secondary students are taking at least one distance course, according to the Digital Learning Compass Distance Education Enrollment Report 2017, and more than 14 percent are pursuing their education entirely online. They, like their on-campus counterparts, are eligible for financial aid – assistance that can be affected by their institution’s accreditation status. Also, schools that lose their accreditation can leave students saddled with debt and unable to find institutions willing to accept their transfer credits. Reputable online schools, as well as distance programs offered by traditional campuses, undergo the same rigorous accreditation process by CHEA- or DOE-recognized agencies. When looking at schools or fields of study that have programmatic accreditation, students should be sure that “reputable professional associations accredit their specific program,” US News advises. The American Bar Association, American Dental Association and similar organizations offer specialized accreditation for individual programs. Continuing one’s education as a working adult can present challenges including balancing coursework, employment, and family obligations. An online degree allows students to take control of their lives and studies when they need it most. Flexible and convenient, online studies can provide the same quality education and degrees as traditional on-site coursework. Maryville University’s online programs are designed for student success and career advancement. Contact Maryville University today to learn more about how working adults can earn degrees that will help them succeed in their careers and in life.